With the new DJI Mavic 2 Pro, will DJI stop making the Phantom? Is it time for you to renew your drone pilot’s license? When it comes to choosing a camera drone, it’s important to keep your intended use in mind. Are you looking to dive into the drone industry with a professional setup, or are you looking for a budget friendly bundle to get some practice with first? We know that there are a lot of options on the market and it can be challenging to find reviews you can trust. With that in mind, we humbly present our Winter 2018 Camera Drone Reviews. Each of the drones reviewed here are drones that we have flown, with our impressions and thoughts on each device’s best applications. Thanks for visiting and we hope you this guide helps you pick the right drone for your needs! When you factor in portability and versatility, the DJI Mavic Pro may be one of the most impressive camera drones ever made. Seriously, this machine is a feat of engineering. Including the battery it weighs only a little over a pound and a half, folds up to be about the size of a 1 liter water bottle (making it amazingly portable), yet it boasts numerous pro-level capabilities. 4K camera? Check. 4.3 mile range? Check. Advanced GPS systems, forward obstacle avoidance, 3-axis gimbal, 27 minute flight time? Checks across the board. Add in the fact that its wide stance makes it one of the easiest drones to fly on the market today, and it’s easy to understand why the Mavic Pro is an industry favorite. If you’re in the market for a camera drone that can take you from the basics all the way to introductory professional, we recommend giving the DJI Mavic Pro a very long look. 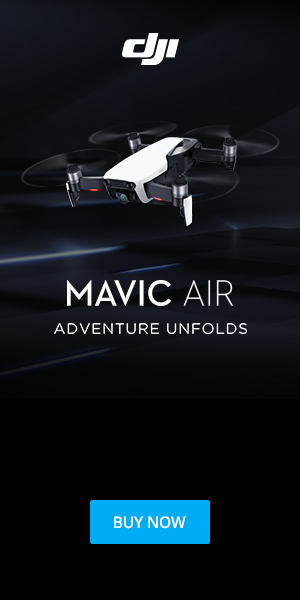 Building off the massive success of the Mavic, DJI has upped the ante with their newest offering, the DJI Mavic Air. This camera drone takes the already diminutive Mavic, and makes it even more compact. It also features 8GB of internal storage, an updated 3-Axis Gimbal Stabilization System, and a top speed of 43mph in Sport Mode. The DJI Mavic Air does offer a bit less flight time than the Mavic Pro, but depending on your needs the lower price point and smaller size more than make up for the tradeoff. Looking for a camera drone that’s lightweight, a blast to fly, and is loaded with intelligent flight modes? The DJI Spark fits the bill. The Spark “selfie drone” can be flown with just a smart device, or it can be synced with an optional controller for increased flight range. Just like the more expensive DJI drones, the Spark has GPS and object avoidance built in. These features help stabilize the drone while maintaining great flight capabilities. This camera drone strikes a wonderful balance between professional features and a carefree user experience. The 720p camera and 2-axis gimbal give it great photo capabilities for such a small body. With intelligent flight modes, including the “gesture” and “follow me” features, incredible action shots and aerial selfies are simple and easy to capture. There are some options to enhance your usage of the Spark. 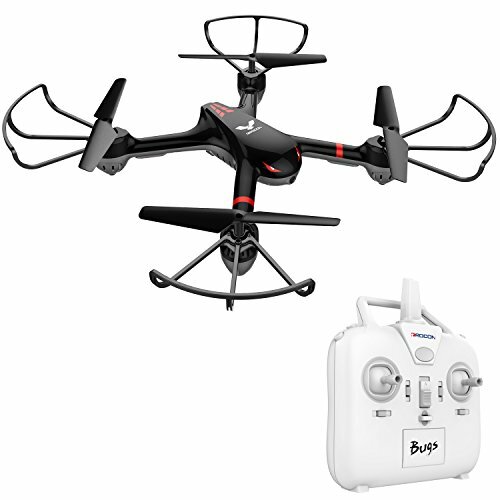 You can buy the Fly More Combo, which comes with prop-guards, extra propellers, remote control, carrying case, 2 extra batteries, and a charging port to dock multiple batteries for charging at once. This will provide you with everything you would need to get the most out of your drone experience. The DJI Spark comes in a multiple colors including alpine white, lava red, sky blue, meadow green, and sunrise yellow. At a great price, this drone makes for the perfect gift. Even the most novice in the field will be able to produce interesting and fun content with this drone. If you’re looking to maximize the bang for your buck, the X-Star Premium from Autel Robotics with a bundled price tag of under $800 might just be the camera drone for you. Aside from its distinctive bright orange color (it comes in white too), Autel’s flagship quadcopter boasts impressive flight characteristics and an equally impressive 12 megapixel 4K camera. And the X-Star Premium comes well equipped with standard features including a rigid splash-proof carrying case, 64 GB micro SD card, remote controller and more. While the current X-Star Premium does not feature obstacle avoidance, it is one of the only consumer-level camera drones on the market designed with a detachable payload. This understated feature promises to make future camera upgrades (yay thermal!) a snap to integrate. The Mavic Pro Platinum builds on the already impressive abilities of the Mavic Pro by reducing in-flight noise and enhancing flight time per battery. 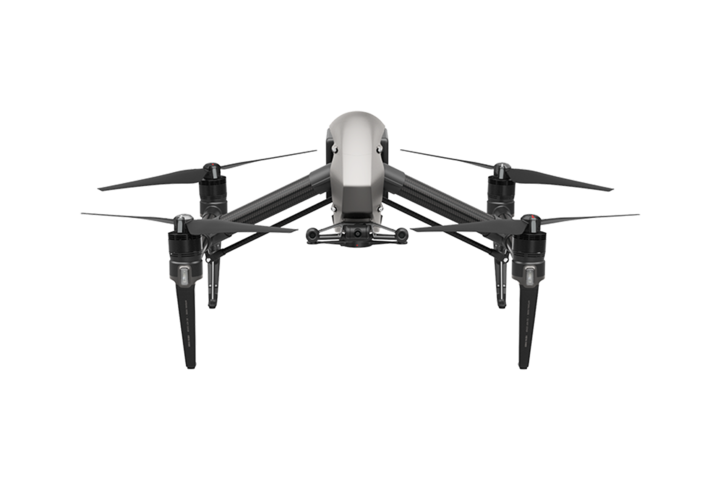 Plus, the redesigned look makes the Mavic Pro Platinum stand out from the crowd. Tip: If you already have a Mavic Pro and want to take advantage of the reduced flight noise of the Platinum model without purchasing the whole enchilada, you can buy the reduced noise props here. In many ways, the DJI Phantom 4 Pro is a wolf in sheep’s clothing. Its ease of use, price point, and popularity make it a great choice for recreational use. But it is also loaded with features that make it a great option for pros as well. 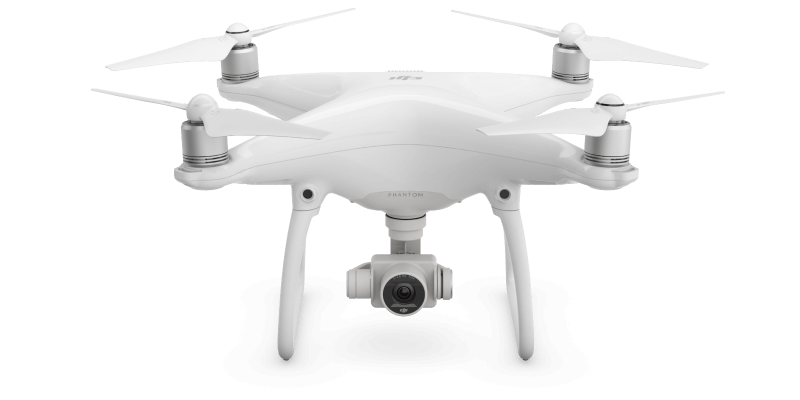 The Phantom 4 Pro boasts an impressive 20 megapixel 1” image sensor, in addition to highly responsive in-flight performance, 4K video capture and a litany of professional grade features. With 4-way obstacle avoidance, multiple intelligent flight modes including active track and terrain follow, industry leading app integration and a top speed of 45 mph, the P4Pro definitely offers more than meets the eye. Add it all up, and you get a highly powerful aerial platform that is currently dominating the upper echelons of the “prosumer” UAS market. DJI recently released their new Phantom 4 Pro Obsidian Drone, which features a slick matte grey magnesium body coated in an anti-fingerprint finish. The DJI Inspire 2 is a workhorse in the fields of aerial videography and cinematography. The body is made from lightweight magnesium-aluminum materials which increases strength while simultaneously prolonging flight time. Highly customizable, the Inspire 2 can be configured with one of the available X4S, X5S, and X7 cameras for cinema-quality images and video capable of recording in high bit rates using H.264 and H.265 formats. Recording is processed by the Inspire 2’s high power CineCore 2.0 image processing system. Plus, the Inspire 2 supports dual operators so that a dedicated camera person can focus on getting the perfect shot, while flight responsibilities remain with the pilot in command. Once airborne, the DJI Inspire 2 is an exceptional flying machine. And with the capacity to accelerate from zero to 50 mph in 4 seconds, and an impressive top speed of 67 mph, the Inspire 2 has the power to follow fast-moving subjects for the ultimate in sports and action footage. Designed for dual LiPo battery use, the DJI Inspire 2 can achieve up to 27 minutes of flight time even in cold climates with self-heating batteries. If you’re looking to explore the drone world (or introduce someone to it) without breaking the bank, we’ve included a list of our favorite budget friendly drones. Currently one of the hottest introductory level drones on the market, the Holy Stone HS170 Predator is an excellent choice in the under $50 category. In fact, this is one of our favorite training quadcopters to provide to students in our programs. Featuring optional headless flight mode for beginners, 3 different speed levels, flip and roll capabilities, and strong overall durability, the Holy Stone HS170 is an excellent drone for beginners and advanced users alike. The quality of this drone is very good, and with easily replaceable parts we’ve found it to have impressive longevity. Last but not least, two of our favorite features of the HS170 Predator are the rubberized feet that allow it to touch down safely (or even gently bounce on a less than perfect landing) and the sturdy and easy-to-calibrate remote controller included. Durable, designed with easily interchangeable parts. If you want to increase your flight time, supplemental batteries allow you to fly while you’ve got more batteries charging. No matter what drone you choose, we always suggest having at least 3 batteries so you can keep the fun in the air longer. We recommend the Holy Stone 2 pack (pictured). The Holy Stone F181W is a Wifi FPV Drone that is perfect for beginners. With the included 720P wide-angle HD camera and live feed, you see what the drone sees on your screen in real-time. And with altitude hold, you can fly with increased confidence knowing that if you let up on the controls, the F181W won’t take a dive, but will instead hover in place. If the stunt person in your life is looking to perform some aerial acrobatics, the 3D flip feature will provide hours of entertainment. With a range of up to 100 meters, one key return to home feature, and 6-axis gyro, the Holy Stone F181W is much more than just an indoor practice drone. This drone is a great introductory choice for kids and adults alike. The Syma X5C is another one of the training drones we provide to our students that attend our in-person training courses. The drone features all of the basics you’d want in a trainer, and at a price point under $50 it’s tough to beat. The X5C comes equipped with a 2.0 MP camera, 6-axis gyro, high and low speed modes, one button 3D flips, and stable flight system, it is a great practice drone that can be flow indoors and out. The Drocon X708W is an FPV training drone with an excellent quality, built-in 720p HD Camera. The FPV HD camera means that you’ll see what the drone sees in vivid clarity. It’s precise, powerful enough to be flown outside, and has a number of user-friendly features that make it a great selection for training and intermediate users. When you download the app ‘Drocon’ onto your smartphone the interface is so easy it’s reminiscent of much more expensive platforms. In the built-in Easy Operation Mode, the drone operates in “headless mode” for easy orientation, and the one key return function helps ensure an easy landing. The Drocon X780W also features high and low speed levels you can earn your wings at one speed, and practice your tricks and advanced maneuvers at high speed. Okay, the HS150 isn’t actually a camera drone, but we had to make an exception for this one. The Holy Stone HS150 might take the cake as the quickest drone at the lowest price point of anything we’ve flown. It’s probably not the best option for the true beginner, but if you’re looking for some speed to grow into at a price that won’t break the bank if you bank into a tree, this is the drone you’ve been looking for. Really, Really Fast: This drone accelerates in no time. And with top speeds up to 50km/h in high speed mode, it’ll satisfy your need for speed. Headless Mode: For beginners, you can fly with the drone oriented to the pilot. Some people find this setting makes the drone easier to control. 2.4GHz 6 Axis Stability: Provides excellent stability for confident flight performance. The HS150 also includes built in frequency protection meaning you can have multiple drones in the air without frequency overlap.